WHAT IS A STABILIZER? A stabilizer is a simple screw-in device that attaches to the bow's riser (handle) just below the grip. The function of the stabilizer is to provide counterbalance to the bow (so the bow doesn't tip forward or back when held at arm's length) and to absorb noise and vibration. The issue of counterbalance is a simple matter of weight and length. The longer and heavier a stabilizer is, the more counterbalance it provides. Across the entire market, stabilizers can range from just a couple inches to over three feet long - and they can be made of anything from plastic tubing to stainless steel. 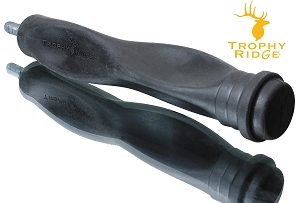 But for mainstream bowhunters, the typical stabilizer is 4-8" long and weighs 4-12oz. Bowhunters don't usually like extra-long weighted stabilizers (mostly because it makes them look like a "target shooter" and because long stabilizers have to be removed every time you put the bow in its case). So the 4-8" models endure in the bowhunting market. 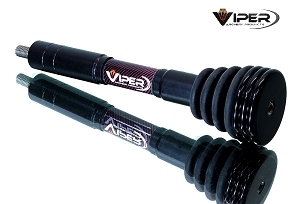 ANTI-VIBRATION CLAIMS` Of course, every stabilizer model claims to have solved the riddle of bow noise and vibration. Sometimes they incorporate carbon rods, soft rubbers, acrylics, vented/fluted tubes, harmonic dampeners, particles of voodoo magic, etc. Frankly, we've been testing stabilizers for 16 years, and we're not entirely sure any of them can really quiet a noisy bow or eliminate hand-shock. Nevertheless, they do help ... some. Unfortunately for stabilizer manufacturers, the modern parallel limb compound bow architecture doesn't leave much work for the dubious dampening services of a stabilizer. Quality compound bows, at least today, simply don't have enough shock and vibration to get excited about. 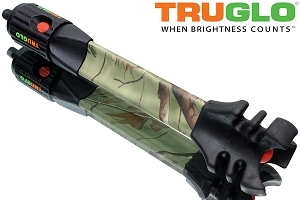 Still, you need a stabilizer, if for no other reason than you need something to keep your wrist sling mounted into place. If you're buying a new bow, get a stabilizer - but don't get too carried away about the anti-vibration voodoo. The counterbalance is what counts.